"The service we received was absolutely first class in every way"
Introducing the all New Ford Edge; Ford's first European premium large SUV. Ford reveal the all new Ford Edge; a large spacious SUV (smart utility vehicle) featuring some of Ford’s most advanced technologies. The Ford Edge will be the flagship of Ford’s SUV line-up across Europe. The Edge will offer technologically advanced Adaptive Steering Technology, will be the first Ford in Europe to feature Adaptive Noise Cancellation and Front Dual View camera system. The Ford Edge has long been available in the United States but the all-new 2015 Ford Edge has been redesigned from the ground up to meet the expectations of European and Global Markets. The Ford Edge will be the third SUV joining Ford’s current line up; a large SUV joining the Ford Kuga medium sized SUV and the Ford Ecosport small SUV. The Edge was first launched to North American markets in 2007, firmly establishing Ford in the “crossover SUV” market. The Edge is one of the top selling large SUVs in North America, breaking sales records in 2013. The Ford Edge is for sale in other select global markets including South America, Russia and eastern Asia to name a few. Ford Europe will be entering into a whole new market segment with the Ford Edge, offering customers a premium refined large SUV featuring a spacious interior and advanced technologies. The all-new Edge will offer premium style, comfort convenience and advanced safety technologies as well as far more room for passengers than many large competitor SUVs at a significantly lower price. The adaptive steering system is designed to continually make changes to the steering ratio at different speeds, optimising steering responsiveness to the current driving conditions. For example at lower speeds whilst carrying out a parking manoeuvre the steering would be adapted to be more agile and easier to manoeuvre. At motorway speed, the steering is adjusted to a rate that allows the Edge to react smoothly and safely to the drivers steering wheel input. The Ford Edge will be the first Ford in Europe to feature Ford’s Active Noise Cancellation system. The cabin features 3 discrete microphones that take ambient sound measurements and then generates and inverse sound wave through the audio system to enhance engine noise and ambient cabin noise. A front spit view camera systems features at the front of the car to give the drive a 180 degree view of the vehicle to help negotiate restricted visibility junctions or tight parking spaces. The Ford Edge delivers an engaging dynamic driving experience thanks to integral-link independent rear suspension. The body structure is constructed from high strength steels making for a far more responsive dynamic driving experience. As well as Active Noise Cancelling technology the interior features acoustic glass to further add to the feeling of in car refinement. The European version of the Ford Edge will be available in two drivetrain configurations. 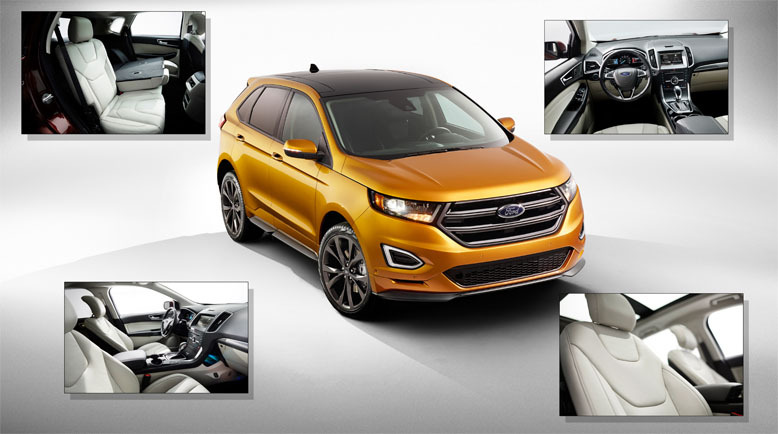 To find out more about the all-new 2015 Ford Edge contact a dealer below.